Copy Dentures - why do I need them? 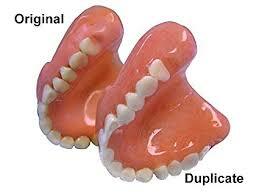 A duplicate denture simply means that we make a replica of your current denture that looks very much the same. They are cost effective and can function effectively as backups in the event that your main dentures are broken and need to be repaired. The duplicated dentures will look and fit very much like your current dentures, but are not intended to be worn as a permanent replacements. However they are real life saviours! If you choose to have duplicate dentures fabricated, you can also choose to have the teeth shade whitened during this process- at no extra cost! Many people choose to have their broken dentures repaired and then have duplicate dentures fabricated so that they have backups in case of future denture breakage. You should always have a spare set especially while travelling in case of loss or breakage.